LIVERPOOL, ENGLAND — The 2018 U.K. Labour conference held in Liverpool, September 23-26, will be remembered as a turning point in U.K. relations to the Palestinian issue. Britain, which is rightfully accused for its role in promoting the Zionist takeover of Palestine, now seems prepared to make amends. In his final speech, on the final day of the conference and following many events and votes on the Palestine issue, Labour Leader Jeremy Corbyn made it clear that a Labour government led by him would hold Israel responsible for its human-rights violations, killing of unarmed protesters, and detention of children. Labour also made it clear it is ready to review the sales of British-made arms to Israel. All of this was achieved in spite of the fact that elements within the Labour Party have been striving to undermine Corbyn’s leadership. Liverpool — a city with a proud history as a bastion of socialism, workers’ rights and unions — seems a natural choice for the U.K. Labour Party to have its annual conference, particularly with the new wave of socialist momentum given to the party by its leader Jeremy Corbyn. Known mostly as home of the Beatles, Liverpool is also one of England’s most diverse and politically engaged cities. Being an historically important port city means Liverpool’s history is also connected to the slave trade, and in August 2007 the city had opened the International Slave Museum so as not to forget the role it played in this horrendous international crime against humanity. Liverpool’s diversity is unique among European cities: it is home to the oldest Black African community in the United Kingdom and the oldest Chinese community in all of Europe. After the famine in Ireland between 1845 and 1852, over 2 million Irish migrated to the city in a single decade. The nickname “scouser” for people of Liverpool comes from an old Irish stew. Liverpool is home to England’s first mosque, established in 1889; and the Princess Road synagogue, which is one of England’s oldest and most beautiful Jewish synagogues. During the Thatcher years, Prime Minister Margaret Thatcher is known to have ordered a “managed decline” to bring Liverpool to ruin, which it succeeded in doing. It wasn’t until the year 2000 that a £1 billion grant from the European Union helped the city to rebuild and regenerate itself, and today it is a beautiful and prosperous town. The EU also helped fund the cleaning of the Mersey River, which was at one point one of the most polluted rivers in Europe; as a result of an £8 billion clean-up of the sewage that once polluted the river, today it is one of the cleanest. As soon the conference began, one thing was clear: Palestine was going to have a significant place in the discussions and resolutions. What was also clear was that there is still a segment within the U.K. Labour Party that is deeply Zionist, opposes Corbyn, and works within the party to undermine him. In fact, an entire anti-Semitism and holocaust denying campaign against Corbyn was fabricated by Zionist groups. On September 25 the conference held a historic vote on Palestine. The excitement in the conference hall was immense and one had to remind oneself that this was not a rally of a Palestine solidarity group but the conference of the U.K. Labour Party, which today is the largest political party in Western Europe. The support for Palestine among members and guests was made evident by the thousands of Palestinian flags held by members and delegates. This aggressive attempt to rewrite history, and erase the victims of the 1948 war, who were expelled or fled from their homes in Palestine. Developing solidarity with Palestinian refugees, especially young refugees, and [exploring] developing links with UNRWA schools, its training centres, and its local staff serving across the Middle East. The British government to increase its level of annual assessed contributions to UNRWA, providing much needed reassurance and stability to Palestinian refugees, and to encourage other member states to do the same. To call for an independent international investigation into Israel’s use of force against Palestinian demonstrators; a freeze of U.K. government arms sales to Israel; and an immediate unconditional end to the illegal blockade and closure of Gaza. The party and its leader renewed their commitment to two things that on their face may seem like support for the Palestinian cause but in fact are counterproductive. The first is a commitment to the Two-State Solution — or, in other words, a Palestinian State in the West Bank and Gaza Strip. And the second is recognition of the State of Palestine. The Two-State Solution is a Zionist idea that has allowed Israel to advance its policies while blaming Palestinians for rejecting peace. History shows that, contrary to popular belief, it was Israel that consistently rejected any compromise that would have led to a partition of Palestine into two states. The November 29, 1947 UN resolution 181 called for a partition of Palestine into two states and was extremely favorable to the Zionist community in Palestine. However, immediately after the resolution was passed, the Zionist militia in Palestine began its campaign of ethnic cleansing and destruction, a campaign that lasted over a year and is now called “The Naqba,” or catastrophe. In 1967 a second opportunity arose for a two-state solution, this time under conditions even more favorable to Israel. 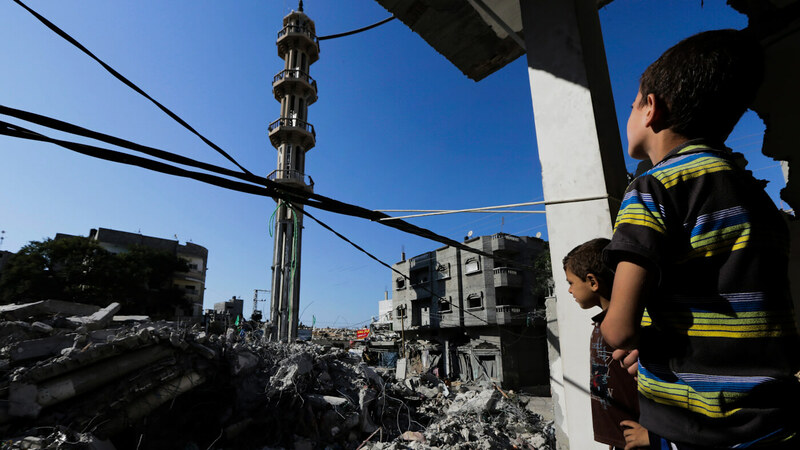 Again, Israel reacted with a massive a operation of forced exile, the destruction of Palestinian towns and villages in the West Bank, and the building of cities and towns exclusively for Jews, thus destroying any chance for a Palestinian state to be established. It seems that the declarations of support for this so-called solution are a sort of lip service given to Zionists so as not to “go too far,” as it were, and demand equal rights for all people who live in what was once Mandatory Palestine. The recognition of a Palestinian state is also a form of lip service –recognizing, as it were, a state that does not exist. This creates the illusion that all Palestine needs is recognition of its status as a state rather than recognition that all of Palestine is occupied, that its people live under a violent oppressive regime and that BDS — boycott, divestment and sanctions — are required to bring about change. Leaders of this community came out to stand against false accusations of anti-Semitism in the U.K. in general as well as in the Labour Party. The Haredi community, which makes up over 20 percent of the 265,000 Jewish people who live in the U.K., came out with a clear message refuting the claims that Jewish people in the U.K. fear for their lives. Regardless of any individual’s political leanings, they said, it was clear that Jeremy Corbyn has always been a friend of U.K. Jewish people and is not in the slightest way a racist or anti-Semite, and that Jewish people live well and have no fear of anti-Semitism. I had the honor of sharing a stage with Rabbi Ahron Cohen, who drove up from Manchester for the final day of the conference, and to stand with Rabbi Beck, who drove up from London to express support. In answer to a question regarding Israel’s right to exist, Rabbi Cohen replied, “what is Israel doing there to begin with?” and he went on to discuss the trouble that was brought on the indigenous communities in Palestine, both Arab and Jew, as a result of the ZIonist occupation of Palestine and the creation of Israel. The presence of the Haredi community, as well as their unwavering support, was a tremendous boost to Corbyn and to those in the party who know the anti-Semitism charges are false. It was an enormous step for the rabbis of this community — who made the effort to attend the conference, even though it was held during the Jewish High Holidays. It was a real pleasure to stand outside the conference hall on a sunny day in Liverpool with these fine people and to see the tremendous support we were getting from conference attendees as they were leaving the hall. Even with its shortcomings, one must admit that the conference was an enormous boost to the cause for justice in Palestine. Furthermore, Jeremy Corbyn, who has been attacked by Zionist and neo-liberal groups working in unison, is as unwilling to bend as ever. In fact, one could argue that the U.K. may soon have a prime minister who is a truly a decent and honest man, and a true socialist who also cares deeply for Palestine.